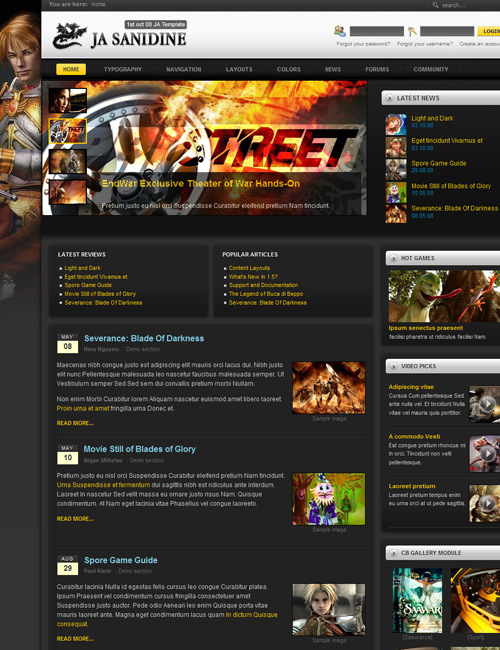 Template Joomla JA Sanidine online community for fans of virtual games. Full visual template integration with Fireboard Forum and Community builder. Beautiful game template for joomla 1.5 from JoomlaArt. JA Sanidine perfect template for your online gaming portal. With JA Sanidine, you can easily set forum, share and discuss hot games. In addition, advanced modules slideshow allow us to demonstrate the game in a quick presentation. JA Sanidine ideal for a gaming site and community gaming enthusiasts!